Many marriages today are under severe strain. And if we're honest with ourselves, most of us can easily identify with this fact. However, is this the kind of relationship that God had in mind when He instituted marriage in the Garden of Eden? Folks, I'm here to tell you that the answer is absolutely not! You see, after Adam and Eve blew it in the garden, they also blew it for the chances of having a perfect marriage. However, that doesn't mean we have to resign ourselves to a life of personal pain and silent suffering. It just means that it's going to take some time and lots of work. Why? Because contrary to popular belief, marriages aren't made in heaven, they're made right here on earth. 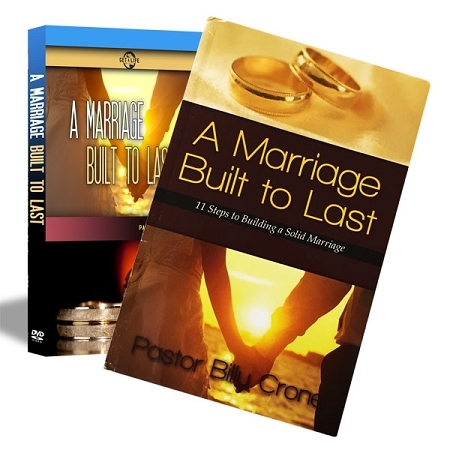 Therefore, in the light of this truth, A Marriage Built to Last is a series that looks at the 11 steps of having a lasting and fulfilling marriage. Such things as Men & Women are Different, Love is an Action, The Need for Romance, The Need for Communication, The Need for Reconciliation, The Need for Honor, The Need for Intimacy, The Need for Biblical Men, The Need for Biblical Women, and The Need for a Strong Family. Remember, being married doesn't mean your life always has to be filled with personal pain and silent suffering. God never said that it would be easy. He just said it's going to take some time and lots of work. And if we'll just get back to God's plan for marriage, then we're well on our way to having A Marriage Built to Last!